Envision, if you will, the recently refurbished baroque vice-regal palace in Mexico City about the turn of the 18th century. In 1692, parts of the residence had been destroyed during grain-shortage riots. Four years later, the newly arrived 32nd viceroy of New Spain, José Sarmiento de Valladares y Aines, Count of Moctezuma y Tula, set out to restore the palace's glory and display his wealth and worldly taste at the same time. As part of his effort, he commissioned an elegant 12-panel wooden folding screen, with tableaux painted on both sides that were inlaid with mother-of-pearl. Stretching some 18 feet in length and 7 1/2 feet tall, this biombo enconchado blended Asian, European and American influences: It borrowed the traditional Japanese folding-screen form known as byobu; bore images inspired by Dutch news prints and French and Italian tapestries; and was inlaid with concha, which means shell in Spanish, using a technique invented in Mexico by local artists. Very rare, possibly unique, in its day, this multicultural hybrid—now split in half, alas—is the only surviving specimen of the genre, according to Richard Aste, curator of European art at the Brooklyn Museum. Sarmiento de Valladares placed his treasure on the upper floor of the palace, where he and his family lived and entertained. There, it separated the ceremonial sitting room from a smaller room where women sipped coffee and talked. Sarmiento, a champion of enconchado painting, was so enamored of his extraordinary screen that when he was recalled to Spain in 1701 he took it with him. Some unknown time later, it was divided, probably to satisfy his heirs. Half eventually ended up in the collection of the Museo Nacional del Virreinato in Tepotzotlán, Mexico. The other half is now owned by the Brooklyn Museum, which purchased it from a Mexico City dealer in 2012. It, too, had a circuitous journey. After centuries of unknown whereabouts, the screen had landed in the collection of Cockfield Hall, in Yoxford, England, probably purchased by Sir Ralph Blois, who inherited the home in 1896. In February 1996, the Blois family put it up for auction at Phillips in London, mislabeled as 18th-century Spanish. Only the Mexican dealer recognized what it was—he bought it for about $5,000. Sixteen years later, he offered it through a London broker to the Brooklyn Museum, which had been collecting Spanish colonial art since 1941, way ahead of most museums. It paid a much, much higher price (the museum declined to disclose it). The screen was painted by local artists whose names have been lost to history, but they were clearly followers of Juan and Miguel González, brothers who were active about 1670-1700 and are recognized as the masters of pearl-inlay paintings. Not much is known about the pair, though art historians have speculated that they may have had some Japanese ancestry (since the mid-16th century, Spanish trading ships known as Manila Galleons had been bringing Asian goods to Mexico in exchange for silver). Aside from being an incandescent beauty, the screen ingeniously served Sarmiento's political purpose. He had been appointed viceroy by Charles II of Spain, an heirless Habsburg who had ascended to the throne in 1661. Spaniards and other European powers were divided by the question of his successor—another Habsburg or a Bourbon, from France, who was closer kin? To signal his loyalty to the Habsburgs, Sarmiento told the painters to portray battles they had won over the Ottoman Empire in the Great Turkish War. For guidance, the artists used two Dutch battle engravings, but they simplified the design, moved some buildings and changed the perspective to an aerial view. 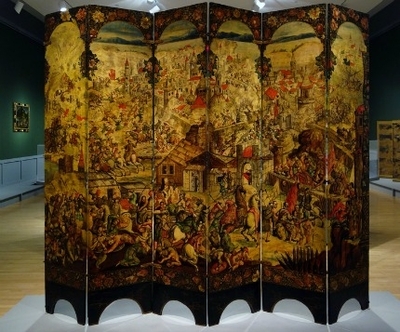 The Mexican half of the screen clearly depicts the 1683 Siege of Vienna, and the Brooklyn Museum was told that the battle continued in its half. To Mr. Aste, however, the cityscape didn't match Vienna. Tipped off by the river in the upper right, which bore an inscription referring to the Danube, he followed the river and discovered about a month after the purchase that the scene was the 1688 Siege of Belgrade, when the Habsburgs captured that city from the Turks. Another inscription, "Croatians attacking Turks," helped, because Croatians were not involved in the Vienna battle. In the Brooklyn screen, Belgrade's red-roofed fortress sits at the center top, with the city below. The city wall, which cuts the picture diagonally, has just been breached. The fight is a brawl, with spears flying and decapitated heads displayed on spikes. Viewers can tell who is who by the warriors' dress: full-armored Europeans, some carrying red-and-white war flags, vs. the Turks, in flowing dress, hoisting crescent-laden flags and brandishing sabers. Surrounded by a floral, arched framing device, the scene is theatrical. At the vice-regal palace, men carrying out public business would have faced this scene. Women would have viewed, on the reverse side, a sight as pretty as the 16th-century Tuscan tapestry on which it was based—one commissioned by Grand Duke Cosimo de Medici for his villa. Bordered in ribbons and floral garlands, this painting portrays a relatively peaceful hunting scene: Gentlemen astride or beside their horses, rifles and spears at the ready, accompanied by dogs. 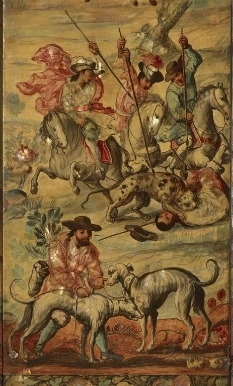 In one panel, on the right, four men on horseback attack a jaguar. The images are sketchier than those on the opposite side; it is, Mr. Aste noted, "less narrative and more decorative." Throughout both sides, the artists embedded thin layers of mother-of-pearl, but not in any pattern, nor within the images' contour lines. Their purpose was to reflect light from the candles that would have shone in the screen's surroundings. The entire surface would have "shimmered," Mr. Aste said (an effect that the museum can't really duplicate, sadly). The biombo enconchado made its public debut in September 2013, a centerpiece of the Brooklyn Museums's "Behind Closed Doors: Art in the Spanish American Home, 1492–1898." It has been on tour with the exhibition since January and is now on view at the last of three stops at the John and Mable Ringling Museum of Art in Sarasota, Fla. When that show closes in January 2015, the screen returns to Brooklyn—though precisely where it will be displayed in the galleries has not yet been decided. This cultural trifecta, made in the Americas, inspired by Japanese form and material and based on European images, offers multiple possibilities.